Here is a brief overview of the structure of a typical four year undergraduate program. 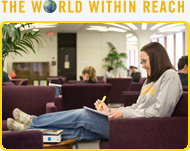 In order to graduate from the University at Albany you will need to earn 120 credits. These credits fall into 4 main areas; major, minor, general education and elective. The pie chart shows the breakdown of these courses for the average student. Most of the courses taught at the University at Albany are 3 credit courses - so typically a student will take 15 credits (5 courses) each semester for four years to complete a degree. It is possible for one course to meet several requirements - for example to count toward a major or minor and to meet a general education requirement. A major is an area of study that requires between 36 and 66 credits to complete. Your major will allow you to focus on a particular field of study in order to deepen your knowledge of that field. A minor is an area of study that requires between 18 and 21 credits to complete. Your minor is a smaller concentration than your major but will also allow in-depth exploration of that field. The General Education Program at the University at Albany proposes a set of knowledge areas, and competencies considered by the University to be central to the intellectual development of every undergraduate. Courses within the program are designed not only to enhance students’ knowledge, but to provide them as well with new ways of thinking and with the ability to engage in critical analysis and creative activity. Electives are courses that do not meet requirements for your major, minor, or general education. Whether a course is deemed an elective or not depends on what you have chosen for your major and minor. However, elective credits are required to reach the 120 credits needed for graduation.